Ever thought about making a comic book? How about a character that would bring something new, something different? What happened was that one day, during a break at school, I was working on a draw in a new style. Whatever came to mind was what ended up on the paper. Fun fact, back then I had a movie stuck in my head – “Corpse Bride”, one of Tim Burton’s brilliant stop-motion films. With that in mind, I started by sketching big eyes and small pupils; then an elongated face and long, pointy hair. Strange how, when you are in the flow of creativity, you can come up with interesting ideas. His backstory – The most unluckiest man on earth. Everything that happened to him was viewed in a comedic way, it’s true, but what made him stand out from other similar unlucky characters like Laurel and Hardy, was his attitude towards his life. He was not the bravest, strongest or even the most interesting person you could find. At the end of the day, he was just a victim of strange and supernatural events. His determination to overcome them was the driving force for his life. He dealt with them to the best of his abilities, remaining the most normal person in his universe. At one point, I got thrilled by the idea of making a comic with Everd. Taking inspiration from the Garfield collection, I wanted to use a three scene strip to tell funny and bizarre moments from Everd’s life. The images would have been pen and paper drawings and, to add another layer of interest, it wouldn’t had used dialogue. There are very few “mute” comics in the world that I know of, so it seemed a very curious area to experiment in. What was unknown to me at that time was the amount of effort I would have to invest on every little detail. In 3 weeks I managed to get the concept down and the style in order. The only problem left was the time I needed to actually finish a drawing for a comic strip. My brother, Wolf, suggested I try going digital, him hoping that it might help me save some time. He was right and wrong at the same time. Instead of spending time on details, I was spending it learning to use Photoshop. Brilliant! Of course, in time my skills got better and I was able to make up to 2 strips a week. 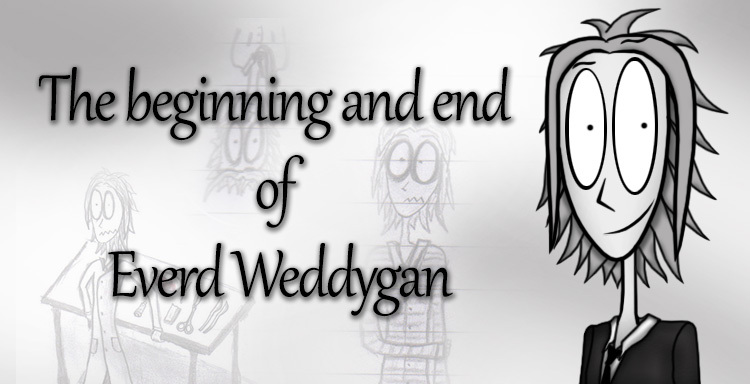 On August 21st, I launched my first 3-scene comic with Everd. It was very badly made, but pretty good for a beginner. 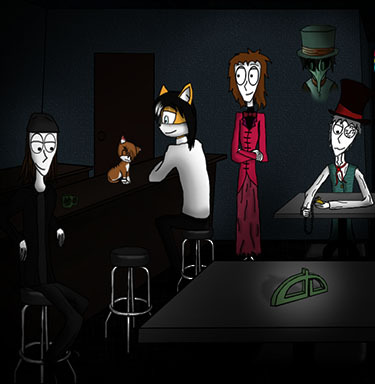 I uploaded it on www.DeviantArt.com and it’s still on my channel, in the Everd Comic folder. After a relatively positive start, I continued by uploading the other 14 strips, one every day. When I started to get the hang of things, my style was flexible enough to integrate characters from other artists. My first reaction was to make more of other people’s OCs, either as gifts or commissions. Unfortunately, that was one of the worst things I could have done. Don’t get me wrong, I loved making gifts and drawings for other people, but I did it in the detriment of the comic. At the end of the second week, I got stuck. There were no more new strips done and my ideas were too scattered to be worth drawing. Spreading too thin and getting distracted were my mistakes and they cost me a lot of time. When I had another set ready to launch, it was January 1st 2012. The fans were almost gone and even my enthusiasm got a bit dry. Not willing to give up on Everd, I thought of writing a book. It would had contained his backstory, family history, day to day life and a new challenge for him to face brought on by a mysterious character I called “Pacient 9311“. Creating the family tree was incredibly fun to do, especially since Everd’s curse came from one of his grandfathers. If you are curious, click here to see the Weddygan bloodline starting from 1787. I tried my best to keep him alive but I felt like Everd was, in a manner of speaking, no longer present. He felt absent and unfinishable. 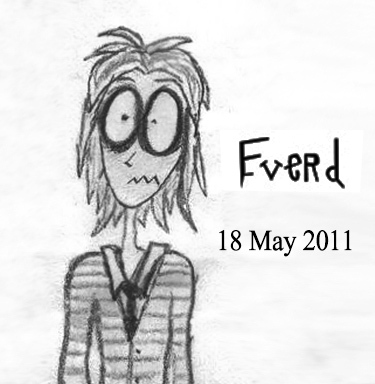 At the end of the day, Everd was a part of my imagination that wanted to express itself. He came from a world where strange things happened on a regular basis. I always let my mind wonder and it comes up with so many strange ideas sometimes. Even thought the comic only lasted for 21 strips, I think it ran its course and said everything that needed to be said. It made people giggle and see things in a different way. At least, that was my intention when I started. Also, don’t think Everd is gone for good. He won’t be making any appearances in movies or comic books yet, but he will still be hanging around in my mind.